Unexpected thoughts from the inside and the outside. 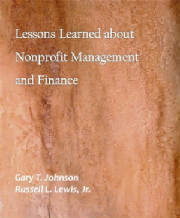 An e-book for nonprofit board and staff members alike. "A gold mine of practical advice. It is going to quickly displace those ten or so books waiting in line." John Pepper, Chairman, Disney Company, former CEO of Procter & Gamble Company, and Co-Chair, National Underground Railroad Freedom Center. Available on iBooks for your iPAD, Amazon.com for your Kindle, and Google e Books for many platforms. The lessons continue: Follow Nonprofitlesson on Twitter.